30 years – Rejoice Today! 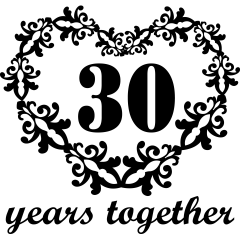 As the time draws near to begin the celebration of 30 years of love, I want to share my thoughts with you. The Friday after Thanksgiving will be the 30-year mark for the day I met my life. January 2nd, 1996, is the anniversary of our first date, coffee 'til midnight at your parents home in Moline. Then that glorious day when I was the nervous one, April 14, 1966, 30 years! Wow!! I want to celebrate each of these milestones with you in my arms at home, and God willing I will, but if not my heart will be with you where ever you are. We have had our ups and downs like most couples but it seems to me that we've had more than our share of challenges. You have been my inspiration for all these years. From the very beginning of our love whenever I felt down or like quitting I would think of you. I didn't want to see disappointment in your eyes, so I'd carry on, try again and refused to quit until I won, and I always won for you, for the look in your eyes, that was always worth what ever price I paid. I have always admired you, your intellect, your beauty, your character, your love and your compassion. You loved me and stood by me, defending me to everyone when I couldn't provide for us adequately or when I made stupid mistakes. How you amazed me when you agreed, no insisted, on taking my children and making them your own. You tempered me and made me a better more considerate parent. The countenance of our children has it's roots in your common sense correction. When I was high, you laughed with me. When I was down, you lifted me up. Only once have you ever turned your back to me, and then only for a moment to catch your breath, and then only after I had subjected you to such emotional abuse that any other woman would have left screaming, but then you are not any other woman. Now I've called on you to walk with me down a harder road than we've ever travelled before. In my heart I know you will, in my mind I pray you have the "heart" for it. I don't know when I'll be home. I will believe for a soon return and I will not doubt, because our God is a good God, who will never leave us or forsake us. We must trust Him. I think back over these 30 years and I know I've never doubted or regretted my desire to marry you and spend the rest of my life with you. I have not been a very good a provider, although I've always tried to be. I've never been a very "cultured" person, but I'm willing to learn, however there is one thing I've done better than anyone could have, and that is to love you! I love you so much, I don't see other women, EVER! I hurt so badly when you hurt that I think it's more painful than if I had to bare the pain myself. I've hurt you again now with this situation, and that is what hurts me the most, I've caused you pain. I would do anything to avoid hurting you, yet once again, I am the one who did it. I feel like "Pogo". "I've met the enemy, and it's me!" I want so much to come home and be the husband you've always deserved, but never had. I pray every day for you and for our home. You deserve so much more than me. I deserve so much less than you, but God saw fit to put us together for His purposes, now if you will, continue on with me to the end of this road as we have said we would, and let us believe our God has our best in mind and if we are patient we will enjoy His rest soon. Your words of not being able to imagine giving up on me, spoken in the midst of such great disappointment and pain of heart, were a powerful healing balm to me. This too will pass. I will return. We will resume our lives. Joy will come in the morning. I reread what I had written, but never mailed, and decided not to change anything, but to add these thoughts. My love for you grows more deeply with each passing hour, my respect for you and all you do increases each day and my resolve to be all I can and more for you gains strength as I allow the thoughts of you to envelope me. You WILL have the husband, provider, and friend you've always wanted and prayed for but never have had. I pledge this to you with all that is in me, and with God's help, it will be so! Amen!